Aventura, Florida, February 18 , 2009 – King Jewelers, South Florida’s oldest and most reputable jeweler in collaboration with Alpina Genève the official timekeeper of the ’12 Hours of Sebring’, Sebring International Raceway, and Primetime Race Group, will hold an exclusive event dedicated to South Florida’s automobile and timepiece enthusiasts. 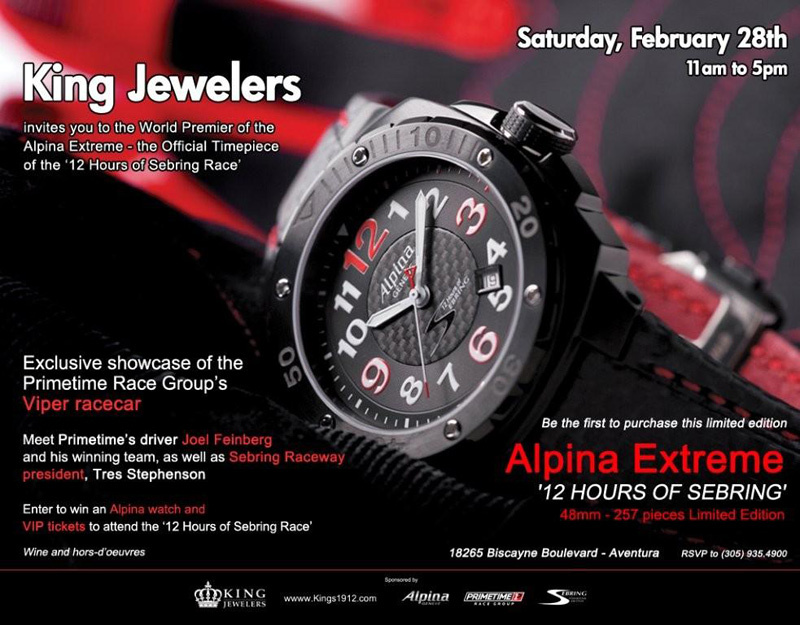 Starting at 11am on February 28th, King Jewelers will be hosting the world premiere of the Alpina Extreme ’12 Hours of Sebring.’ For the 57th edition of this renowned race, Alpina, Swiss manufacturer of high quality sports watches, developed this exciting special limited edition – 257 pieces worldwide. The watch capitalizes on the strong brand philosophy of Alpina, combined with the important requirements of the drivers in the race: highest level of accuracy, extremely high readability, shock resistance, sturdiness and reliability. 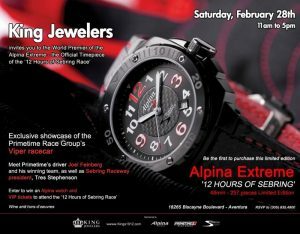 At the Alpina Extreme ’12 Hours of Sebring’ event, King Jewelers will have for sale series numbers 1 through 5, and will allow customers to pre-order the same day. Highlights of this special event will include a ‘Meet & Greet’ and autograph session with Primetime Race Group’s team owner and champion driver, Joel Feinberg. The world’s fastest Viper, the Primetime American Le Mans Series GT2 racecar, will be on display in front of King Jewelers for photo opportunities. Tres Stephenson, Sebring racetrack president will receive the first Alpina Extreme from the hands of Alpina Genève official USA representatives. Visitors may enter to win an Alpina watch and VIP tickets to attend the ‘12 Hours of Sebring Race’ while enjoying wine and hors d’oeuvres. Established in 1912, King Jewelers has proudly styled jewelry aficionados from around the world. For five generations, the King family has owned and operated King Jewelers while building an outstanding reputation steeped in quality, value, and first-class service. Offering a magnificent selection of jewelry collections including fashion-forward Italian designs, classic diamond creations, luxury Swiss timepieces, estate jewelry, modern designer jewelry, as well as colored gemstones and fancy colored diamonds, King Jewelers is the one-stop jewelry shop that prides itself in being one step ahead of the trend. At King Jewelers clients will always find the “best of the best,” for any style or budget. The salon also offers bridal, baby, and gift collections. In addition, King Jewelers offers on-site jewelry and watch repairs, custom design services, appraisals, estate buying and corporate gift programs. King Jewelers is a member of the Jewelers of America, American Watch Guild, Jewelers Board of Trade, International Wristwatch Leading Watch Retailer, and the American Society of Appraisers and has among its staff GIA Certified Gemologists. For additional information, please visit www.Kings1912.com.